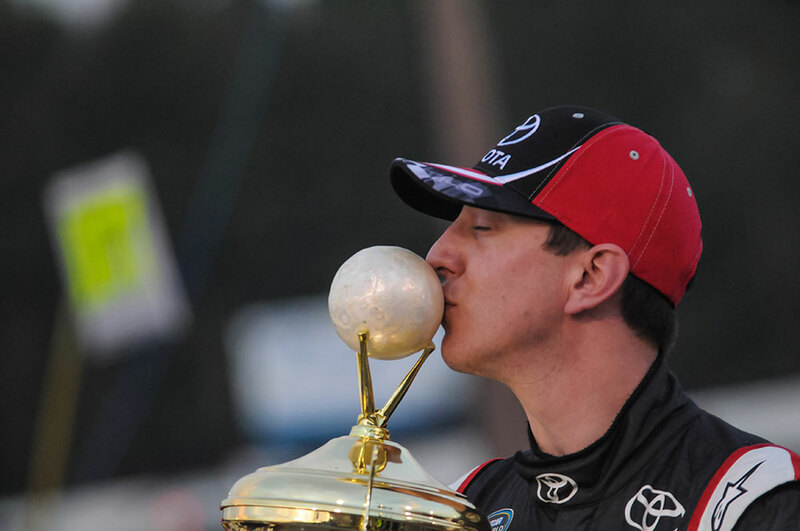 After starting 15th and running third for the majority of the second half of the 50th Annual Snowball Derby, Kyle Busch dug deep in the late stages and was able to bring home his second Tom Dawson Memorial Trophy. After restarting third with 66 laps remaining in the 300-lap event, Busch was able to work his way around Bubba Pollard for second place with 22 laps remaining and then maneuvered past Jeff Choquette for the race lead with 16 laps to go. Once out front, the Las Vegas native cruised to the victory in the prestigious Super Late Model event. Throughout the week’s numerous practice sessions, the No. 51 Toyota/Phoenix Construction Camry showed good long-run speed, but didn’t fire off like the way some other competitors could. Busch qualified a disappointing 15th on Friday night, but ended Saturday’s final practice session sixth quick. The No. 51 Camry began moving forward once the race started, despite communicating that his Toyota was tight handling. He had made his way up to the fifth spot before pitting for four tires and fuel under caution on lap 76. With the field employing several different strategies, KBM’s owner-driver restarted 11th when the field went back green on lap 89. Busch took advantage of his fresh tires as he advanced up to fourth place on lap 100 and 10 laps later was able to make his way around Jeremy Doss to lead for the first time. After spending 10 laps at the front of the field, Busch was pressured by Choquettte and Pollard and decide that it was too early to push things as he settled into the third position. 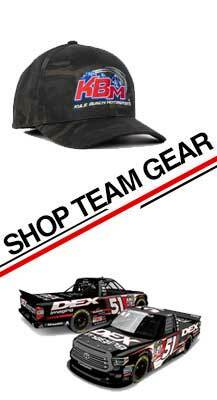 Harrison Burton was also able to make his way around his NASCAR Camping World Truck Series owner, leaving Busch in the fourth spot when the race reached the halfway mark. Crew chief Rudy Fugle summoned Busch to pit road for the second time of the day under caution on lap 171. A speedy four-tire stop by the over-the-wall crew gained the team two positions and the No. 51 Camry took the lap-179 restart from the second position. On the ensuing restart the inside lane got a strong surge and Busch fell back to the third spot. Busch remained scored in the third position for the final restart of the race with 66 laps remaining. The race would remain caution free the rest of the way. Choquette and Pollard had a sizeable lead on Busch and it appeared that it was going to be a two-car race for the win, but their lap times continued slowing in the second half of the run when Busch’s times had stabilized as he began narrowing the gap with 30 laps remaining. The No. 51 Phoenix Construction/Toyota Camry continued to post fast lap times as he maneuvered around both Pollard and Choquette in the closing laps to pick up KBM’s third Snowball Derby victory. Noah Gragson finished 12th in KBM’s No. 18 Switch Camry, while Cole Rouse and the No. 46 Toyota Racing team were relegated to a 25th-place finish after a cut tire caused major damage with 82 laps remaining. What does this win mean to you? Did you think the race was going to go green the final 66 laps? When did you sense that this car was special today?